GAR - Summary from Malcolm - Aug 2014 and NEW GAR page NEW useful for those not using Sky Demon ..... there are people not using Sky Demon? Wow! This section is for members to report a planned/unplanned flyout. If you have a report to submit please email it here in either .doc or .txt or .rtf format and photos will always enhance a story! At the recent AGM Matt Gregory volunteered to start a Breakfast/Lunch Fly Out during the winter months and keeping the airfield within 1 hour or so flying time. We had seven aircraft turn out for the first one and the weather was amazing considering England was being hammered by Storm Angus. Bravery (or stupidity) Award went to Nick and Matt who flew the open cockpit EAA biplane. 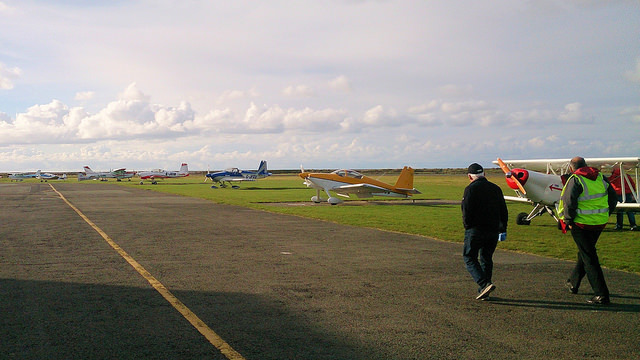 "As a student, and relatively new to this flying lark, I had a great day out with a friendly, helpful bunch. The weather and scenery were superb too. Special thanks to Bob and Rob for letting me fly with them, allowing me to take the controls and for sharing their knowledge and experience. 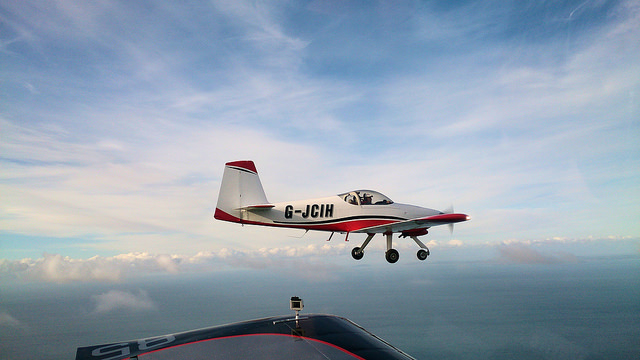 I'd recommend it to all students as a way to learn, have some fun and see some real-world flying, away from lessons." Gary Doherty. Off to France for Ooh La! La! or so we thought! The intrepid six gathered down at the airfields highly a steamed Ritz (Propeller) Café to pour over the pre planned paperwork and argue the technicalities of the Sky Demon wizardry that would deliver us safely to the French shores! John with his sky Demon pre-prepared print offs and French maps, Martin with his fag packet and dodgy glasses and of course Malcolm, well who needs a flight plan any way when you've got laser eye surgery to investigate! Sorry better introduce the pink arrows flight team before we go any further! John (say again) Fisher, the veteran war hero who despite still suffering the shrapnel effects on the hearing side manages well with the hearing aid screeching on feedback. Martin (Get it down your neck) Stevens who can match the RV's liquid consumption to the liter, Malcolm (Encyclopedia) Evans who to be fair knows f..king everything and the support crew Tony(Kitty man ) xxxxxx , who as a first time attendee was allocated the financial responsibilities for food and beverage, Rob (Gold Tops) Giddings who as entertainments guru was mainly blessed with winding John F up and origami with the coat sleeves. That leaves just one that's me, the rookie, newly out of the Cliff Day flight school and allocated the job of news letter for the pink arrows flight crew, oh and sole carer for John F while the usual Spar manager was taking a good respite break in the Haverfordwest psychiatric home. Anyway, back to the preplan arrangements, having got the flying club high spec PC computer to fire up and after around ten versions of the Met office weather report it was decided that the trip east would be dogged with bad vis, high winds and lots of CB's!! However to go west would be a safe option so Martin donned a new fag packet and we hastily drew an alternative to the west coast of Ireland! Further drawn out heated discussions waded through the merits of GAR forms and special branch notifications and it was clear that not even I could drink that much tea to sit out the twelve hours notice for special branch so Malcolm was dispatched to sort some friend of a friend phone call out and implement some distant ruling that nobody had heard of but he came up trumps and we were sent dashing for the plane hangers to get the trip rolling. After a straight forward flight over the Irish sea and in extremely loose formation we put down in Galway on the west coast which looked all sized up for a substantive capacity airport but eerily quiet with little to no sign of activity. This was born out on our entry to the building when all normal services seemed moth balled and the offer to house our planes in the new hangers showed an emptiness of either parked or hangered aircraft. A taxi ride into Galway allowed us to negotiate tickets for the Saracens-Connaught rugby game that evening and once booked into the hotel it was a usual quick turnaround, new battery in the hearing aid and out to find a good restaurant and then the game. Once in the restaurant John F usually does his normal party trick and turns the white cloth and carpet red! He didn't disappoint and then well that was the first bottle merlot gone! After the game it was back to the town and samples some of the delights of an Irish Friday night out. Well to be honest in the two days we spent there I don't think it mattered what day or time it was due to the exhaustive nature of the partying Irish!! The center just bounced all day and nearly all night, what happened to the European bail out? No cut backs here. The airport might be on deaths door but the residents certainly are not! Our first night was a bit of a tester and I had a bit of a job on my hands but luckily once John F was tucked up with his continent pad, coco and his aid battery removed he seemed to sleep sound as a pound! Oblivious! 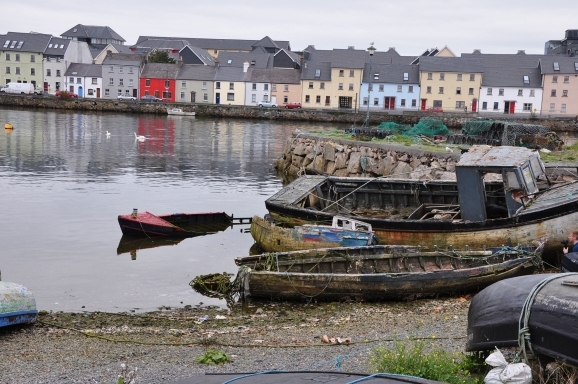 After two nights rocking in the social delight of Galway it was time to move on and this time to the quiet little Inis Mor, one of the Aran islands. We departed Galway airport in the same eerily silence as when we had arrived with the few scarce airport personnel appearing in multi functional roles as we processed our way out into the hanger and said our goodbyes to the illusive tower controller. Out to sea and staying just under the cloud at around 1500ft it was only a 20 minute hop onto the short little island runway that should you cut it short you are looking at being in the brink and get it long you are definitely in the brink! Get it right and you settle on the narrow strip with more humps than a pregnant camel! The little strip was serviced by the three part time staff that obviously had other responsibilities a like to farming and running the local lobster trade. You sort of get the feeling this is one big family occasion. 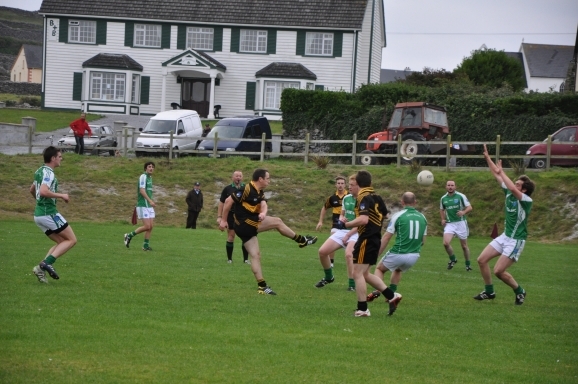 We sampled the local (only) public house and the food didn't disappoint and after a brief display of the local Gaelic football talents, we headed back to strip to await the arrival of the air strip part timers to release us back on our merry way. Safely up and heading further south our next intended destination was to be the beautifully scenic Kerry with the well known tourist drive route known as the Ring of Kerry. Following the coast line for much of the way the views and coastline certainly stand out and one can't help but ponder on why such idyllic scenery has eluded us for so long. The west coast of Ireland really has so much to offer and it is really only a stones throw away, we really must take more advantage of this being such an accessible destination. Approaching into Kerry from the west meant in over Tralee, right of the quarry and lining up for a 08 trying to keep ahead of the Ryan air flight who was catching us up!! With two ahead first one down was Malcolm and his attempts to vacate 08 hastily down the "No Entry" emergency service road had the controller singing into our radio sets and us knowing exactly where not to go! All three of us down and in behind comes the Ryan Air flight which as it parks up to the terminal, means all hands on deck for the ground staff and a 20 minute wait for us before the shuttle taxi comes to pick us up to ferry us into the terminal. Once in we by pass the irate departing Ryan Air passengers as apparently the plane is being commandeered by Ryan Air to another airport and the programmed flight cancelled!! Good old Ryan Air! The customer's airline!! Any way we shuttle off to the pilots lounge where we are met by Noel, well not sure of his title but he seems to pull some weight here, who offers his apologies as he has to dash off to calm his rather upset Ryan Air passengers but kindly offers us up some tasty snacks and a bottle of champagne to keep us happy and make us feel welcome! So we hastily tuck in and well yes, a glass of champagne wouldn't go a miss would it! What's good enough for Ryan Air crew is good enough for the Welsh contingent!!! This is what you call a welcome!! Noel was more than helpful and definitely a handy chap to get to know. His knowledge and hospitality went down a storm with this hardened crew! And it wasn't long before he was arranging the night's restaurant fixture and local hot spots and definitely if in doubt when in town, just mention Noel by name and all seems to fall into place!! It took a lot of coaxing but eventually, much to Martin's disappointment at having to leave a second full bottle of champers in the fridge, two hire cars sorted and the help out of Malcolm's credit card, off we toddled into Kilcarney and found ourselves a reasonable hotel right in the centre and well placed for the night time economy! The restaurant arranged by Noel was literally round the corner and didn't disappoint. Have to say it has to be one of the top food quality venues we have yet to experience. Very relaxed and friendly and the food spot on! I think the staffs undoubtedly were quietly impressed at the array of empty wine bottles that had amassed through the three courses, not even a scour from the manageress as John performed his usual color transformation of the table cloths to the merlot red!! All laughs and any way that was another £14.95 to the well hammered drinks kitty! Tony pay up we're off!!! The next day we had appointed drivers for the day and set off in the cars to experience the Ring of Kerry!! A popular tourist drives of the magnificent scenery, heritage and cultural beauty of the county vicinity. The views are spectacular and the pace of life so relaxed. The area seems affluent in terms of wealth but the pace of life and sense of urgency is distinctly cool. The tour takes you around the heritage interests and through the towns and villages that seem to be moth balled ready for the active to return. At a coastal town of Waterville there was a great awareness of the famous inhabitant Charlie Chaplin who spent apparently much of his latter years here to find a peaceful existence out of the limelight and be a familiar figure in amongst the residents. The only way to have bettered the tour would have been to fly it! Now that would have been an experience and a challenge!! Drive over, back to the hotel and time for a de brief and explore the numerous weather accounts for the following day. A cold front was approaching and at best guess we need to be taking off before it by 11.00am local at best. Onto the ipads and flight plans and GAR forms need to be sorted. This is the fun part as nearly always something doesn't quite work but have to say roll on Sky Demon, definitely making the process much easier and hopefully will soon be doing the GARs too!! To inform special branch we end up ringing Dyfed Powys Police who most helpfully take charge and apparently inform us that special branch only work 9 to 5 so anything outside the hours doesn't matter! Mmmh wouldn't trust that one!! Once we had convinced Martin that the bar man at some time would have to close the bar to go home we eventually managed to bed down and be ready bright and early to hit the skies for the return journey. After giving Noel the thumbs up on the welcome and hospitality front, it was time to fire up and head home. The weather was just closing in behind us but the flight east was into the rising sun and clear skies and proved a spectacular viewing over the Irish east coast and cross the Irish Sea to the West Welsh coast. 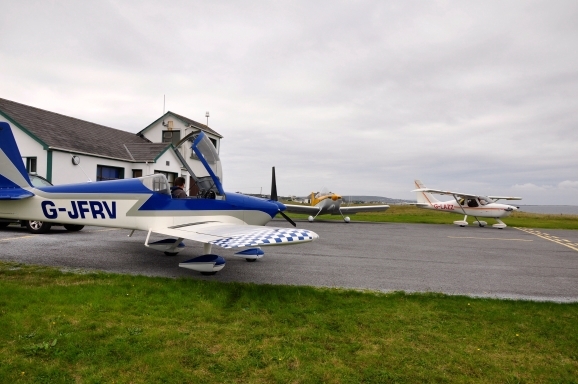 Departing Kerry and about 20 mile out the radio crackled with a discussion on some aircraft material currently found on the active runway and some departing traffic couldn't match the blue strip of fiber glass to his aircraft. Wait a minute that's our color isn't it I asked John? That's what the rattle was?? Any way its quiet now and we're still flying! It wasn't anything structural!! Just the canopy strip! Thank you Kerry, no need to save it, we will continue!! Phew you have to trust permit built!!! Once back to Haverfordwest it was time to pack away the aircraft, hit the Propeller café for one last mug of tea and after settling the costs and a brief reminder of the highlights. Summary to date:- good journey, good hospitality, good laugh, good food, good destination, good company, good value? well I'd keep off the Guinness and stick to the Av Gas, it's cheaper!! it was now time to break formation and head back to the day jobs. Rob back off to work gods own land, Tony to pick up the spanners and catch up on the MOTs, Me back to local government and £20 million cut backs, Martin to ensure the alcohol sales of Carmarthen recover the recent loss, John to ensure the balaclava clad crow bar swingers of Lamphey make it to crime watch and Malcolm, well actually nobody is quite sure what Malcolm does , perhaps it should be answers on a post card and send it to the Pink Arrows adventure crew, Haverfordwest flying club, FL1 1NG. Next trip - Corsica! Anybody fancy! Members of Pembrokeshire Flying Club took advantage of some exceptional flying weather on Saturday's Fly Out to Halfpenny Green. Congratulations go to John Wilson, pilot and navigator, for his first cross country since attaining his PPL (Photo above right departing). 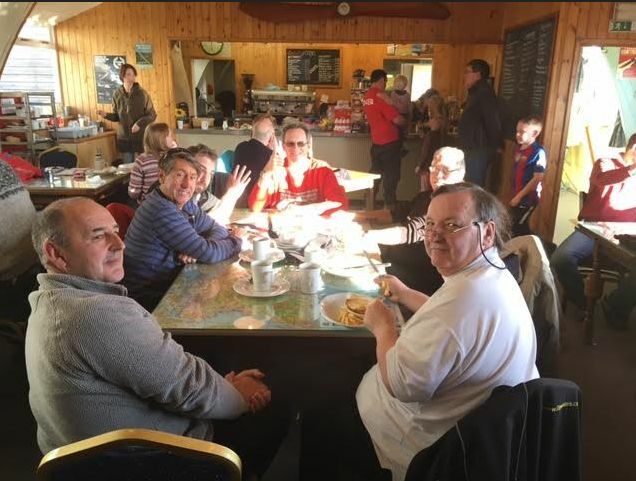 Once parked up a very welcome meal was enjoyed by all in the Tower Cafe overlooking the airfield with a panoramic view, that can be safely recommended as a destination to be enjoyed. Using ones own aircraft or renting is not a cheap way of entertaining oneself or others so lets have a look at mitigating some of the expense. One way is to not pay duty or vat or be able to reclaim at least the duty when paid. The following applies to those who do not rent an aircraft although there is an opinion that whoever pays the duty are the only person(s) who can reclaim the duty cost from the government. For this exercise I have taken a fairly simple scenario best applicable to those based at EGFE or nearby and using only hard runways of at least around 800 metres. I will use my aeroplane for this exercise it holds 178 litres of avgas and has used in the UK at least one full tank of fuel since it last returned from abroad and I have receipts to prove it. 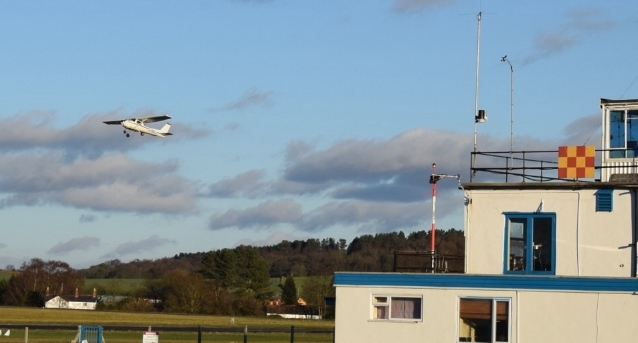 Onwards to Enniskillen(EGAB) or your tour around the north,-landing fee £12.00 cafeé on the airfield fuel cost £1.45 no vat or duty provided the next stop is not in UK airspace. 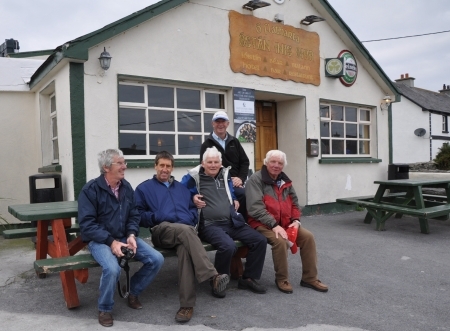 You could now go back the way you came or to any landing site in the SOUTH would suggest maybe Sligo(EISG) distance 35NM landing fee E15.00 not sure if refreshments are available but a short walk to town or a dip in the sea.